There are a lot of ways to learn Internet marketing, but there is no source anywhere that has been as consistently accurate on predicting future trends – and reinforcing proven fundamentals – as the System. 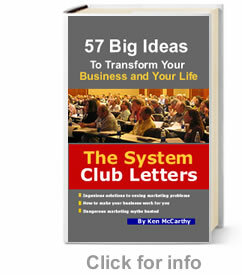 Here’s an example of the in depth analysis and advice that System Club members get that the general public never sees. The opportunity to take part in a live training with the faculty of The System Seminar is no longer available, but The System Club is open to anyone who is serious amount Internet marketing. You’ve probably noticed that things are not getting easier. And in all likelihood they’re not going to get easier. If using the Internet and other media channels is important to your long terms goals, you should take a close look at what the The System Club offers. Why get your Internet advice from amateurs and shysters when you can get it from the Pro who was the original source of many of the strategies and techniques that proved to be the ones that worked – and continue to work to this day.